Recently I have been seriously craving salads. I think it's the changing of the seasons - phasing out soups and heavier winter meals and replacing them with sandwiches and salads and all those delicious spring/summer foods. So, I've been eating quite a few "bucket salads" lately - not sure if that's a real name or something I read on a blog somewhere, but basically, it's just a giant salad full of whatever you feel like adding. It's an intensely filling and delicious dinner: I use 50 calories of lettuce, 150 calories of chicken/ground turkey/canned tuna/etc., 150-200 calories of beans/tofu, and whatever spices I want. Mashing up the beans/tofu not only makes the salad extra delicious, but using it instead of salad dressing makes the salad extra filling. Sometimes I'll go wild and add leftover veggies I have in the fridge, like fresh mushrooms. My go-to spices are ground cumin, chili powder, garlic powder (NOT garlic salt! ), or ground mustard - a little goes a long way with all of them. Another summer-y food for me is seafood, which is one of the things I miss about not living on the Connecticut shoreline anymore. Occasionally, though, I will splurge and buy a nice piece of fish or some shellfish - it's a nice change from my usual chicken or turkey. So this week, I was looking for something that (a) involved seafood and (b) was a light and summer-y salad. I found a recipe on Epicurious for a shrimp, cucumber, and mango salad that served six, so I modified the recipe for my portion size and my taste. Theirs was tossed with a vinegary mustard dressing - which sounds delicious, but not when paired with mango. So I used ground ginger instead, which added a light tropical heat. Perfect! 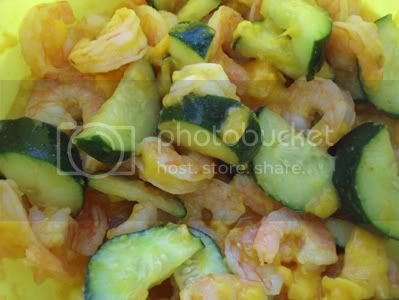 This is the finished salad mixture: one large mango, cut up - one medium cucumber, cut up - a half pound of medium shrimp, cooked and peeled - and a teaspoon of ground ginger. I mixed it all up and let the flavors soak in for as long as I could stand (about half an hour) before tossing it all up with some lettuce (I used iceberg because it's what I had, but spinach would have been really good, I think!) and going to town on it. It was a little sweet for my taste - next time, I'll probably vary the spices to make it a little hotter and balance it out - but it was definitely delicious and something I'll make again. I'd also like to try it with grilled shrimp instead of boiled - we'll see what the summer brings! It would even be good with other fish, something else I'll have to consider for next time. What about you? What are your favorite summer foods? What would your ideal "bucket salad" have in it? mmm.. My favorite bucket salad is crunchy iceberg lettuce, warm grilled chicken, tomato, avocado, persian cucumber, red onion and a generous dash of Montreal steak seasoning. I haven't had it in a long time, so I see it being on my menu sometime this week. Never called them bucket salads, but my husband and I do that every Saturday. That recipe looks good!! I agree with the vinegary-mustard not going with mango. I have never heard of bucket salads but they sound really good!! I think I will have to try some!